About 4,000 of the 5,000 terrible cliches about instant ramen begin with starving college students. As Karen Leibowitz explains in Lucky Peach, Momofuku Ando didn't aim to stuff hungry co-eds with his creation—he wanted to end world hunger. In the last hundred years, Japan has given the world a number of remarkable inventions — the Walkman, the bullet train, the digital camera, the fuel-efficient car, karaoke. But in a poll conducted in December 2000, the Japanese people chose instant ramen as the greatest Japanese innovation of the twentieth century. And as unlikely as it seems, instant ramen's creator, Momofuku Ando, had exactly such ambitions in mind. Instant ramen may seem like a trivial consumer product, but it has helped millions of people survive economic and natural disasters, which is no small accomplishment. And in the aftermath of Japan's recent tsunami and nuclear crisis, with instant ramen feeding thousands of displaced citizens, Ando's legacy has proven its importance once more. On August 15, 1945, the day after Japan surrendered to the Allies, Ando was walking through his hometown of Osaka, surveying the damage wrought by years of war. The city had been spared the atomic bombs dropped on Hiroshima and Nagasaki, but it was devastated nevertheless. Aerial bombings had destroyed the factory and two office buildings that Ando had built, leaving him in search of a new occupation. During his walk, he stumbled across a group of people gathered in the wreckage behind the train station, lined up outside a makeshift ramen stall and waiting for something to eat. Ando thought: People are willing to go through this much suffering for a bowl of ramen? As it turns out, noodle soup is a near-universal comfort food, and Japanese people turned to ramen for comfort. Food shortages continued to plague Japan for years after World War II, and Ando concluded that hunger was the most pressing issue of his time. He believed that "peace will come to the world when all its people have enough to eat." Ando wanted to help Japan feed its entire population. He was not obviously suited to the task; he had become a bank president after the war. But in 1957, when the bank failed and Ando lost his job, he undertook the monumental project of filling the national pantry. Ando remembered the demand for ramen he'd witnessed more than a decade earlier. Then he got to work making a mass-produced noodle soup that would satisfy the harried workers of an increasingly industrial country. Ando spent a year trying to preserve ramen noodles without success; the texture of the rehydrated noodles was never right. But one day, the story goes, he threw some noodles into the tempura oil his wife had heated to make dinner, only to discover that frying not only dehydrated the noodles, but also created tiny perforations that made them cook more quickly. Instant noodles were born. And so, at the age of forty-eight, Ando embarked on his third and final career: Mr. Noodle. "I came to understand that all of my failure — all of my shame — was like muscle added to my body," he said later. He'd felt terribly guilty when his bank failed, and instant ramen promised a kind of redemption. Ando promoted his product with a nearly religious zeal, as though he were on a crusade to feed the world — to end hunger with ramen. When Chikin Ramen, Ando's first product, hit the shelves in 1958, the Japanese public initially saw it as a luxury product — it cost slightly more than fresh soup at the local ramen shop. But consumers quickly embraced the convenience of making ramen at home, and sales took off. 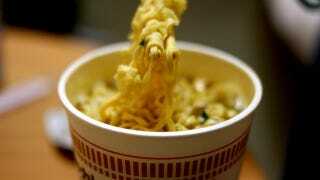 Instant ramen became a staple food in Japan, and other companies entered the market. Ando, in turn, looked for international customers. Undaunted by the American consumer's ignorance of ramen and even chopsticks, Ando declared "Let them eat it with forks!" On a business trip to the united States in 1966, Ando had his next great idea. According to legend, Ando was demonstrating his product to supermarket executives in Los Angeles when he observed them repurposing their Styrofoam coffee cups as ramen bowls . Intrigued, Ando replicated these makeshift containers for a new product, which took five more years to develop. When Cup Noodles debuted in 1971, they were an immediate sensation: Nissin, Ando's company, has now sold more than 20 billion units. Instant ramen packaged in its very own heat-resistant container — what could be more convenient? Space ramen, that's what. Ando developed "Space Ram," a vacuum-packed instant ramen made especially for Japanese astronaut Soichi Noguchi's trip on the Discovery space shuttle, in 2005. Space Ram is edible even at zero gravity, with a broth thick enough to prevent dispersal and smaller noodles that can be cooked without boiling water. When Ando died in 2007, Noguchi delivered a eulogy to a baseball stadium full of mourners, including two former prime ministers of Japan. One of the former premiers praised Ando as "the creator of a culinary culture that postwar Japan can be proud of." Momofuku Ando turned instant ramen into a national symbol, and instant ramen turned Momofuku Ando into a national hero. Like modern Japan, Ando rose from the tragedy of World War II to become an economic powerhouse. As the head of Nissin Foods, Ando developed the company from a personal hobby into a multinational corporation, one that now earns more than $3 billion in annual net sale. The day before his death, Ando visited the Nissin factory in Osaka to give his annual New Year's message, though he had officially retired in 2005, at the age of ninety-five. Over the years, Ando had used these speeches to articulate his thoughts on ramen, which had gradually developed into an expansive and inspiring philosophy. (A book of his collected wisdom was distributed to all 6,500 attendees at his funeral.) For Ando, "the fundamental misunderstanding of humanity [is] believing that we can achieve all of our desires, without limitation." Ando was acutely conscious that resources are limited relative to human demands. In culinary terms, that means prioritizing nutrition over nuance. Instant ramen may not taste exactly like fresh ramen, but it just might feed the world, and shouldn't that count for something? Ultimately, ramen has become a unifying symbol of sustenance around the world. Ando wanted to design a food that would sustain human life through the most difficult times, and instant ramen does so with spectacular efficiency. As of 2008, global consumption of instant ramen reached 94 billion packages per year — that's an average of fourteen bowls per person. In the modern world, instant ramen has truly become the food of the people. As Momofuku Ando put it, "Mankind is Noodlekind."